BUFORD, Ga. — Joe Vellano and his wife, Brittany, had just returned home after a day that didn’t go exactly as planned. But if Vellano’s four years in the NFL have taught the couple anything, it’s the importance of being nimble. The Falcons broke training camp on Monday. After two-and-a-half weeks staying in dorms at the team’s practice facility, the players could retreat to their own beds. Their families were invited to the morning practice, and afterward there were no meetings, just a big picnic. Brittany had been watching practice from a tent along the edge of the field. She and Joe, college sweethearts from the University of Maryland, were just married in April. Another player’s mom, while making small talk, asked her how she handled the stress of roster cuts. We’ve been through it so many times now, Brittany told her, it almost gets easier. But, at the same time, it doesn’t. It’s a paradox you have to live to understand. Since Vellano came into the league as an undrafted free agent in 2013, the defensive lineman, now 28, has appeared on the transaction wire a dozen times. Cut; re-signed; promoted from or assigned to the practice squad. Out on the sun-baked practice field, his goal is to avoid yet another transaction. Not long after having this conversation, Brittany noticed the guy in the red No. 94 jersey, her husband, had gone down. He was hard to miss; about two-thirds of the way through practice, when the rest of his teammates headed off to a tent for a hydration period, Vellano was alone on a knee in the middle of the field. The Falcons had just finished a period of 11-on-11 team drills, which for Vellano meant that he waited patiently on the sideline for exactly six reps with the third-team defense. On the sixth, a run play, he caught someone’s finger—he’s not even sure if it was the guard or the tackle—in his left eye. Ouch. The trainers draped a towel over his head, and then walked him back inside to the training room, where they turned the lights down. Vellano tried coming back outside a short while later, but the glare from the Georgia sun was painful, and there were just a few minutes of practice left anyway. Call it a day, the trainers told him. What was he going to get anyway, three more plays? A few hours later, Vellano was sitting on his couch after a check-up at a nearby eye doctor. He’d be fine; there was just a small abrasion on the cornea. He was prescribed eye drops and dimmed all the lights at home, but that didn’t deter him from watching that morning’s practice film on his iPad. Even as he blinked away the discomfort in his left eye, he wished he’d had those three more plays. 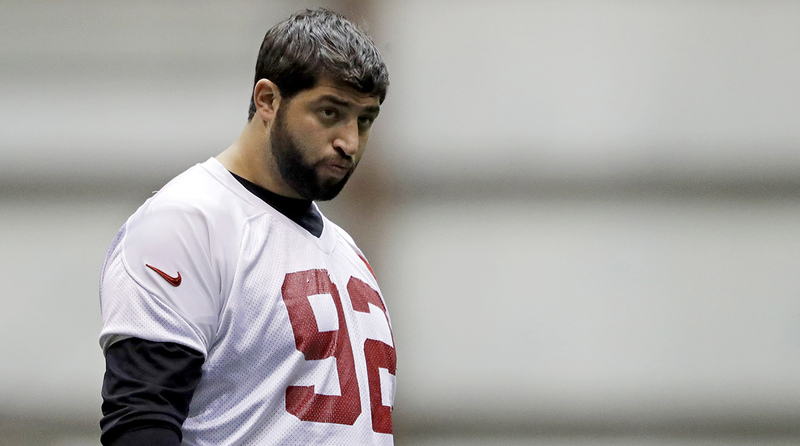 Vellano during a practice leading up to Super Bowl 51. Despite his strong play in the NFC title game and Super Bowl last winter, he's battling for a roster spot this summer. ​Vellano’s is the story of the hundreds of players trying to earn their way onto 53-man rosters across the NFL, battling in the August heat for the spots beyond the entrenched starters and the high draft picks and the guys with big contracts. For a player like Vellano, this time of year is “crunch time,” as he puts it, which is why every rep he gets matters; and why, even when the team was given an afternoon off and he’s got a scratched left eye, he refuses to put away the film on his iPad. Now isn’t the time to take a break. “The underdog mentality, of not being locked in, sticks with you every day,” Vellano says. Just six months ago, Vellano played 22 snaps for the Falcons in Super Bowl 51, but the NFL is only about what you can do next, and he’s competing for a roster spot among perhaps the deepest position group on the Falcons’ entire roster. Vellano has a minimum salary contract with no guarantees. He and Brittany are living in a condo with a sixth-month lease that expires in September. They’re hoping to renew it. In just four years, Vellano has experienced pretty much the entire NFL life cycle. He started eight games as an undrafted rookie with the Patriots in 2013, stepping in for Vince Wilfork after the stalwart of the New England defense tore his Achilles tendon. He won a Super Bowl ring with the Patriots in 2014, though he was inactive for the game. He’s played for three different teams’ practice squads (New England, Indianapolis and Atlanta). He’s been cut during Labor Day Weekend roster trimming. He’s been cut four weeks into the season to make room for players coming back from suspensions (not Tom Brady). And, incredibly, he’s been cut 36 hours after his apartment burned down. Vellano got a call from his landlord last September, less than a half-hour before playing the fourth preseason game with the Patriots. His duplex in Attleboro, Mass., was on fire. He played the game, returned to find his apartment totaled, and on Saturday morning, while living at an extended stay hotel with Brittany and the couple’s families, got the call from the Turk to come to Gillette Stadium. A day after that, they were in the car headed back to Vellano’s hometown, near Saratoga, N.Y., when his agent called while they were stopped at a Starbucks: The Falcons were signing him to their practice squad. They turned around, headed for the airport and Vellano hopped a flight to Atlanta with a single duffel bag. Four months later, right before the NFC championship game against Green Bay, Vellano was called up to the Falcons’ active roster. Of the 26 NFL games he’s played in, three were conference championships and one was a Super Bowl. That remarkable swatch of experience makes it somewhat easier to embrace the ride. But on a Monday in August, the big picture doesn’t matter. He’s hyper-focused on details so small, they wouldn’t be discernible to an outside observer. When Vellano was at Maryland, he was the first player on the team to watch film at home on his personal iPad. He spent his own money to buy the software system the coaches used, and he’d give his tablet to the video guys to load practice tape and game film from that week’s opponent. It took hours to upload the footage. He’s a happy camper now that he can sit on his couch two hours after practice, dissecting his technique in the O-Line vs. D-Line drills. 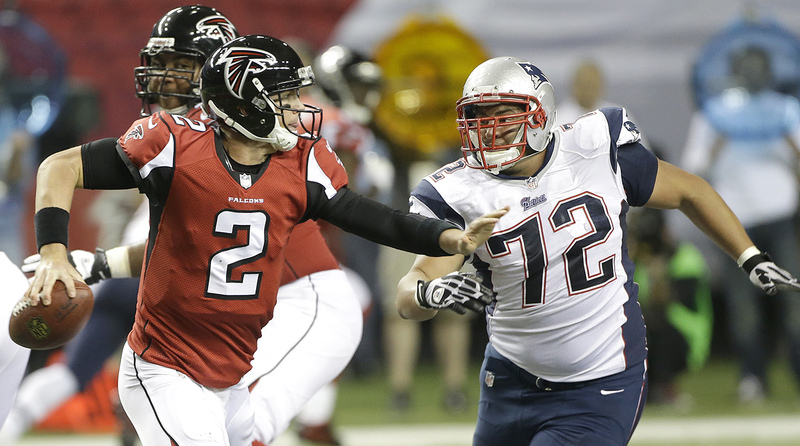 As an undrafted rookie in New England, Vellano started eight games and recorded two sacks, including this one of Matt Ryan, a teammate for now. At the end of Falcons practice, Quinn has instituted what he calls a “Plan D” period. It’s an impressive sight, seeing players who have sweated through a two-hour practice with a heat index in the 90s, spending extra time running routes or slamming their bodies into padded dummies. The coaches write up reports on this period, too, and the whole idea is to devote time to developing the younger guys on the roster, so a Joe Vellano can be called up right before the conference championship game and contribute in a meaningful way. Quinn is an unfailingly positive guy, so this is also his way of providing some antidote to the pressure of the annual late August roster squeeze. He wants the players to focus on bettering their techniques and sharpening their own skill sets, rather than just trying to best the teammate they think they have to beat out for a roster spot, or getting discouraged if they think they can’t. That’s the mental battle for every player on a roster bubble. There are 14 defensive linemen currently on the Falcons’ roster. A basic understanding of NFL roster arithmetic suggests probably only nine of these players will survive the cutdown to 53. That’s five guys from one position group who will be let go, and even if you make that cut, rosters are never final in the NFL. In Atlanta, veterans Dwight Freeney and Jonathan Babineaux are gone from last year’s roster, but the Falcons also added Dontari Poe and Jack Crawford in free agency and drafted defensive end Takk McKinley in the first round, creating the deepest defensive line group Quinn, entering his third year with the Falcons, has had in Atlanta. In some ways, Vellano’s mindset is exactly the same as when he was an undrafted rookie who hadn’t played a single game. Nothing is guaranteed. He and Brittany bought furniture for the first time this offseason, but it wasn’t because of any great sense of security—they figured they’d be in Atlanta for six months during the offseason program, and no matter where they live and what they are doing, they’d need couches. In other ways, though, he has a very different approach. The first time he was cut, in Week 5 of the 2014 season, he didn’t know what to do. Then, he was re-signed to the Patriots’ practice squad two days later. There’s a weird feeling of comfort that builds once you’ve been cut—and cut hours after your apartment burns down, for that matter—and realize that it’s not the end of the road. Vellano is in a bit of uncharted territory now, though. He no longer has practice squad eligibility, so it’s either the 53-man roster or nothing. The first preseason game went well; Quinn singled him out to the media for his performance, and he earned the second-highest grade among all players in the NFL for preseason Week 1 from analytics site Pro Football Focus. A few days before Atlanta’s second preseason game, he gets a little philosophical when he talks about how he has to play—this is the experience of being in this position. Versatility on the defensive line is very important to Quinn, a former D-line coach, and Vellano is versatile—he can line up at nose, defensive tackle and even end in a base defense, able to match up against centers, guards and tackles. Quinn loves that about him. He’s also a heady player who Quinn describes as having the mindset of a linebacker, in the way that he makes sure that his teammates are lined up correctly and tells them what to watch for on the next play. Months after the Super Bowl, Vellano is still thinking about a play in the second quarter, the series right after Tom Brady threw a pick-six. He and Vic Beasley were running a stunt, and Vellano picked the guy blocking Beasley, while Beasley looped around to get in Brady’s face. Beasley hit Brady as he threw, and the pass wobbled—but the play still resulted in a 15-yard completion to Martellus Bennett. Could they have done something else to change the trajectory of that play by just a few inches? “Sick on that one,” Vellano mumbles. Competing for a roster spot is a little bit like that. It may not be the Super Bowl, and millions of eyes may not be on the very play he’s obsessing about, but it feels just as monumental. You never know when or how the deciding factor will present itself.